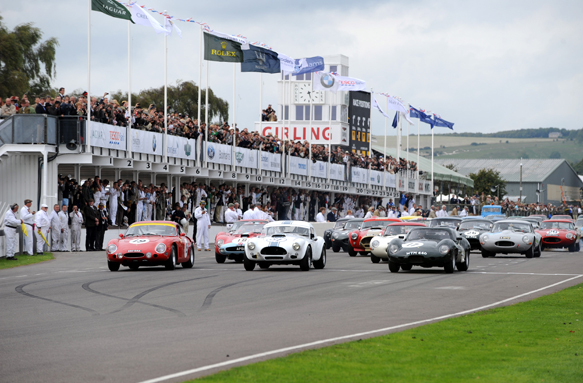 It's September and in the international historic racing calendar that means just one thing; the Goodwood Revival. Marcus Pye outlines the various highlights expected at the 14th running of the event, which includes a celebration of 100 years since the birth of Juan Manuel Fangio, who first raced at Goodwood in 1952, and features a number of star drivers such as eight-time Le Mans winner Tom Kristensen (sharing a Ferrari Daytona with Indy 500 winner Kenny Brack in the TT retrospective), former F1 aces Gerhard Berger, Martin Brundle and Jochen Mass and rally legend Stig Blomqvist among many others. 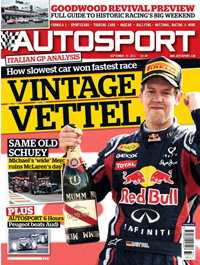 Italian GP report - Our 14-page analysis reveals how Sebastian Vettel won the Italian GP despite his Red Bull being the slowest car in a straight line, and all the other key stories from the Monza weekend. And, as usual, we bring you full qualifying and race reports, technical appraisal and results from every session. Mark Hughes column – Our grand prix editor recalls the tragedy of the 1961 Italian GP at Monza in which title-hopeful Wolfgang von Trips and 15 spectators were killed in a second-lap accident 50 years ago. GP2 Monza – The final two races on the F1 support series calendar brought joy for category veteran Luca Filippi, whose win in the Feature race and fifth in the Sprint secured him runner-up in the final points reckoning. Glenn Freeman reports on his win and Christian Vietoris' success in the last race of 2011. GP3 Monza – Young Finn Valtteri Bottas clinched the title at the final round of the year, capping a great 2011 for ART in the category's sophomore season. Glenn Freeman was in Italy to see him do it. McLaren AUTOSPORT BRDC Award nominations – It's your chance to vote for who you think deserves a chance to be part of the best driver 'scholarship' in motorsport – an accolade won a few years back by the likes of David Coulthard and Jenson Button. WRC Australia – Ford's Fiesta WRC hadn't won at the top level since the opening round in Sweden, but it all came good down under for works pair Mikko Hirvonen and Jari-Matti Latvala after the dominant Citroen DS3s of Sebastiens Loeb and Ogier crashed out on the opening day. David Evans brings his full report. World GT1 Beijing – The Young Driver Aston Martin squad ended its two-race Chinese tour with a double one-two in the Beijing rain. Alex Muller and Tomas Enge took the qualifying race, with their team-mates Stefan Mucke and Darren Turner winning the championship event to move right up on to the series leaders' tails with one round to go. AUTOSPORT 6 Hours Silverstone – The latest spat between Audi and Peugeot in international sportscar racing produced another classic, with the French eclipsing the Germans on British soil in the fifth Intercontinental Le Mans Cup tie of the season. Gary Watkins kept score in LMP1, LMP2 and GTE. F3 Euro Series Silverstone – The three races at Silverstone produced three different winners for three different teams in Roberti Merhi (Prema), Marco Sorensen (Mucke) and Marco Wittmann (Signature). Charles Bradley watched them all and saw Merhi edge closer to the title. From the archive – South African lady racer Desire Wilson on her dramatic win in the Silverstone 6 Hours for De Cadenet in 1980. Race of my life – French F1 veteran Jacques Laffite recalls his win at the 1979 Brazilian GP at Interlagos in the Ligier JS11.